Lined by thousands of miles of glorious golden coastlines, Mexico offers a holiday experience like no other. Here are six of the top beaches that will inspire you to embark on a trip to the largest country in Central America. This coastal resort town in Quintana Roo is a popular spot with the locals, as it’s quiet and somewhat removed from the tourist area. Near to Cancun on the east side of the country, it’s usually filled with local families who come to relax in the evenings and on the weekends, often with a picnic and drinks. An interesting part of this beach is that the cenote water – a natural swimming hole that was revered by the Mayans – flows into the ocean, bubbling up and creating a small river. This water is fresh and large enough for visitors to wade around in, and as it is no deeper than a metre it is perfect for the kids. Known as one of the best beaches in Mexico, this beach is often packed with tourists and locals because of its shopping plaza, bars and restaurants nearby. Its popularity means it’s often a common boarding location for cruise ships, with a breathtaking view of the sunset. This is another beach where the shade is pretty much non-existent other than a few Palapas (open-side beach dwelling) so be sure to take your sun cream, hats and sunglasses to keep yourself protected. A secluded beach lined with palm trees and white sand, Playa Paraiso in Tulum really does live up to its name – Paradise Island. The crystal clear water makes it perfect for snorkelling or swimming, and when you do take a brief walk from the water you’ll be confronted by a dramatic Mayan ruin on 45 feet of cliffsides, a spear’s throw from the waterfront. Despite that, it is often a quiet beach with very few crowds and is surrounded by a handful of affordable restaurants and bars. 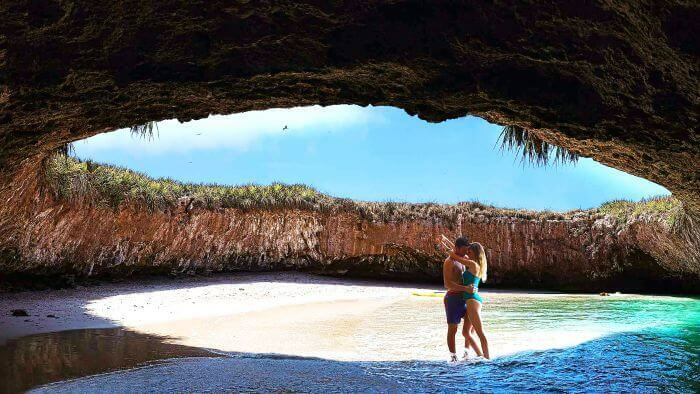 Relatively easy to get to from Mexico City, you will very rarely see a tourist on this secluded beach. A popular spot during seasonal holidays such as Christmas, New Year and Easter. A largely unspoiled beach famous for its rock formations known as Diamond Rock, Playa de Balandra near La Paz is uncrowded despite its splendid set of shallow bays that make it one of the more unusual beaches on offer. It’s a great family destination as it is made up of shallow bays no more than waist-deep, although watch out for the occasional stingray. This is the best place for someone who is looking for a quiet and relaxing spot that is close to Cancun. It’s very popular with the locals as they can escape all the goings on in the centre of Cancun which is about a 30-minute drive away. There is no public transport to this beach so bear in mind you might have to order yourself a taxi, but it will be worth it once you’re greeted by shallow blue-green waters and white sand. There are no surrounding buildings but there are people selling drinks and snacks along the beach. It is the ideal place for a jog that many locals take full advantage of in the early mornings and evenings. Why not join them?